Kitchens are one of the most highly used spaces in a home and require materials and products that extend the longevity of the space. Creative Kitchen & Bath Studio countertops exhibit exclusive properties that contribute to the safety, durability and hygiene of a kitchen. Quartz surfaces are 90%-93% pure clear quartz particles combined with resins, polymers and pigments to produce a stone slab. The inherent durable of natural quartz when combined with these binding agents results in a non-porous product requiring no sealing, is resistant to staining, chipping and scratching and offers the beauty of natural stone. Quartz is typically stronger and more flexible than granite and are very consistent in color and pattern. Mother nature makes granite; it is 100% natural. 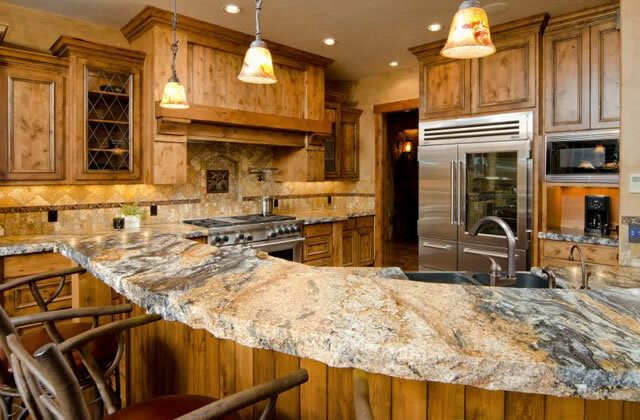 Granite is unique in that it is one-of- a-kind which is the beauty of this product. It is not quite as strong as quartz countertops but is still extremely strong and durable, resistant to chipping and staining and will not fade or discolor when used in a sunny location or “hot” location. Many people like the concept of exclusivity-they like the idea that not no one else will have the exact same countertop as they have. 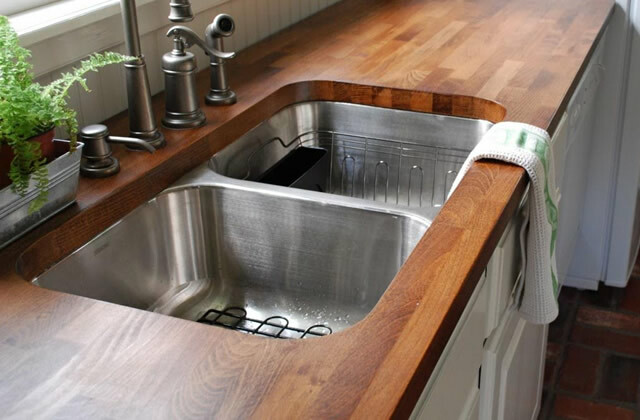 “Solid Surface” countertops are a solid, non-porous material composed on acrylic resins and natural minerals to create a smooth slab of material easily cut and fabricated by general wood working tools. 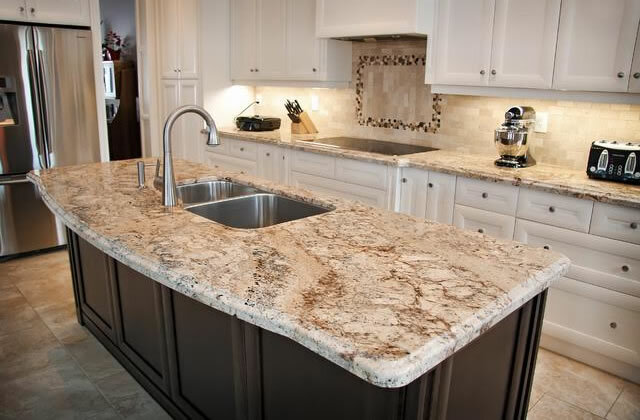 Being non-porous, solid surface materials cannot be stained or harbor bacteria making them excellent for kitchen and bath countertops as well as shower stalls and tub surrounds. 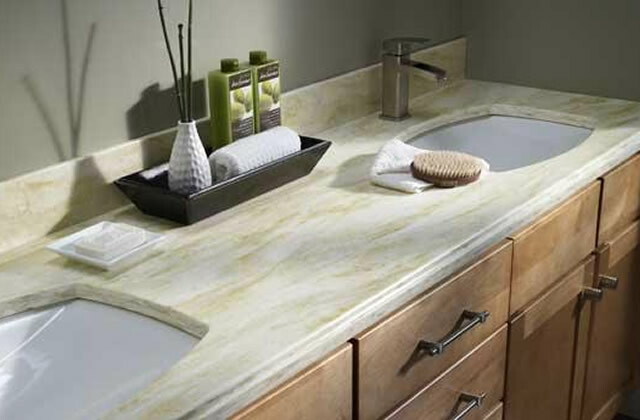 Solid surface countertops and sinks are “seamless” once installed and very easy to maintain. They can scratch or scuff with normal use but can be buffed or sanded back to their original luster as needed. High pressure decorative laminate (HPDL) is commonly used for residential and commercial countertops and cabinetry. HPDL is a paper-based product created by bonding melamine-impregnated decorative papers to layers of resin-treated kraft papers under high heat and pressure. In the press, decorative papers are permanently bonded to the kraft paper to form a sheet of laminate which can then be applied to a substrate to create your countertop or cabinetry. 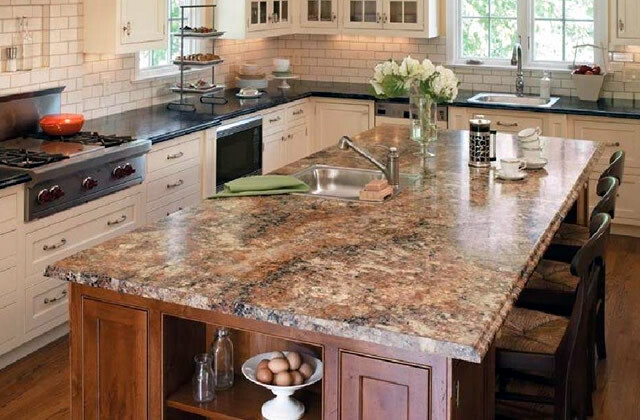 Laminate countertops are less expensive than quartz or granite but can look like a natural stone; with a number of textures and decorative edge profiles available. They are durable and easy to clean but can be scratched or dulled with time. Wood countertops add instant warmth and charm to a kitchen. They are available in many wood species and colors and make a great prep-area countertop material. Wood tops withstand cutting and chopping without dulling knives and can be sanded at any time to renew the finish. Wood is vulnerable to moisture and heat and may expand or shrink with extreme dryness or moisture. Wood tops should be sealed periodically with a food-safe oil.